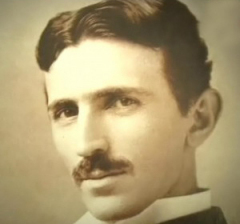 Nikola Tesla was born on July 9, 1856, in a very small village called Smiljan, in the province of Lika, Croatia. You may not know who this man is, but he invented the theories of electricity we use today. Tesla finished his basic schooling in Croatia. He continued his education in the Polytechnic School in Graz and finished at University of Prague. He worked as an Electrical engineer in Germany, Hungary and France before coming to the United States in 1884 as an immigrant. When Tesla arrived in New York, he quickly obtained a job with Thomas Edison. Tesla worked for Edison for many years until finally there differences in methods separated the two men in 1885. There two main differences were that Edison believed that DC (Direct Current) was the power of the future. Tesla had been working on the AC (Alternating Current) power we have today. After the Tesla left Edison's lab, George Westinghouse, founder of the Westinghouse Electric Company, bought patent rights to Tesla's system of alternating-current. There were many advantages to Tesla's alternating current vs. Edison's direct current. The advantages became prevalent when Westinghouse used Tesla's Alternating current to light the World Columbian Exposition at Chicago in 1893. It was after this that people started to realize this type of electricity's amazing abilities. Tesla established a laboratory in New York City in 1887. His electrical experiments ranged from an exploration of electrical resonance and many studies of various lighting systems. In order to calm the public about the safety of Tesla's power system, he would hold exhibitions of his power in his laboratory. He would light a light bulb without wires allowing the electricity to flow through his body in a spectacular flurry of lighting and sparks. Tesla became a United States citizen in 1891. His creative powers were at its peak. He worked on and developed many things including the induction motor, new types of generators and transformers. He also developed a system that transmitted his AC current. There are so many things that you use today that Tesla created. It is little know but the lamp we use to conserve energy, the fluorescent light was also one of his inventions. Tesla had many interests in electrical power. Tesla best known for his method of a wireless power transmission. The Tesla Coil. He envisioned that he would transmit power straight through the air to the user for free. Amazing and truly a ground breaking idea. He started construction on a wireless power transmission tower in 1900. The project was abandoned due to his lack of financial support. Tesla soon turned his genius to other inventions, such as power generating turbines. He continued to have many problems with his financial support and many of his ideas were shelved. Nikola Tesla is one of my favorite inventors. He had electricity flowing through his blood. The man invented so many things we take for granted today and received very little credit. He was well ahead of his time. We may thing that Edison was a great inventor and he was, but Edison and many others took Tesla's ideas and exploited them to the things we have today for there own profit and took the credit themselves. We know now know this man was exploited and was not given credit where credit is due. Many Electrical Engineers still study Tesla's notes in order to find an idea that can be exploited and elaborated today. Tesla is most credited with His Tesla Coil. This coil will deliver power through the air with a great deal of voltage, like a lighting bolt. The wireless age is upon us, is Wireless power next? "Before I put a sketch on paper, the whole idea is worked out mentally. In my mind I change the construction, make improvements, and even operate the device. Without ever having drawn a sketch I can give the measurements of all parts to workmen, and when completed all these parts will fit, just as certainly as though I had made the actual drawings. It is immaterial to me whether I run my machine in my mind or test it in my shop. The inventions I have conceived in this way have always worked. In thirty years there has not been a single exception. My first electric motor, the vacuum wireless light, my turbine engine and many other devices have all been developed in exactly this way." Nikola Tesla "Science is but a perversion of itself unless it has as its ultimate goal the betterment of humanity." Nikola Tesla Nikola Tesla died in New York on January 7, 1943. There is a lot of information on Nikola Tesla available. I have only touched on the tip of this mans genius. Take some time and look him up. You will be amazed!